We all see the news of the aftermath of a big storm or unfortunate weather event and know what nature is capable of. Images of homes with roofs blown off, people’s belongings scattered all over the front lawn, water in every single room of the house. While these might be worst case scenarios, they can and do happen. If you live in an area of the country that is especially storm prone, and you are worried about what to do with your belongings to keep them safe, below are some tips to help put your mind at ease. If you know you live in a hurricane prone area, or worse yet, if there are reports and warnings on the news about an imminent hurricane in your region, you might have to start making some tough decisions about what to do with your belongings. Many people have self storage units at the ready for just such an occasion, and you are going to need to decide what to store and what to leave in the house. Many people choose to transfer things with a lot of monetary and sentimental value (such as jewellery and family heirlooms), or pieces of furniture that are irreplaceable and have been in the family for generations. Many storage facilities in hurricane prone areas offer self storage units that are specially designed to be able to withstand big storms, however, not all do. Look for a facility with covered loading docks, hurricane-proof windows, and back-up generators that will ensure your climate controlled self storage unit doesn’t all of a sudden become a hot, sticky swamp. Even if you are storing things in a self storage facility which has the necessary contingency measures and precautions in place to protect your belongings during a big storm, you should always hedge your bets and make sure everything valuable is off the ground. If you have crates, or vertical shelving units, those can help minimize the chances of water damage to things like electronics, clothing, photographs, books, etc. With the climate changing and big, potentially damaging weather events becoming more and more frequent, as well as unpredictable, it’s good to know that self storage units can still help mitigate some of the potential damages. 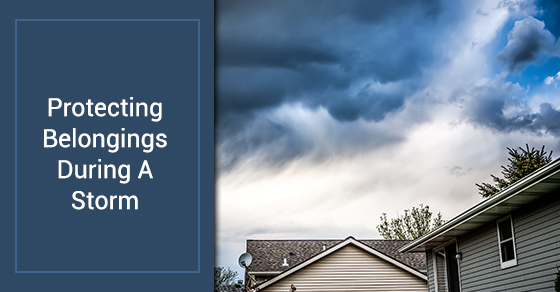 If you are concerned about the security and safety of your belongings in an area prone to storms, and want to take the necessary precautions to minimize any damage, keep the above recommendations in mind.